Often considered to be a combination of nutritious foods or a food mix used to boost energy levels for anyone involved with various levels of exercise. Consisting of a mixture of dried fruits such as raisins, nuts, seeds, and possibly oats and/or chocolate. All of the mentioned ingredients serve a purpose for campers, hikers, individuals involved with fitness and exercise, and outdoor enthusiasts who expend higher levels of energy during their activities. The fruit contains sugar and simple carbohydrates that provide nourishment and are quickly burned. Seeds, nuts, soy nuts, and bits of chocolate provide fat, calories and caffeine (caffeine is in the chocolate) that help to store some of the nutrients longer and aid in assisting with keeping the mind alert. Salt contained in the nuts replenishes sodium depleted as a person sweats or exercises. When combined in a mixture, the ingredients work together to provide an uplifting and lasting energy enhancer, especially for those times when the energy level needs to be lifted to continue being active. 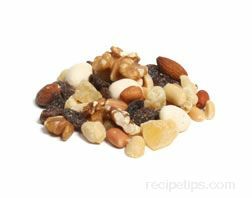 Abbreviated for "good old raisins and peanuts" as some refer to it or "granola, oatmeal, raisins and peanuts" as others call it, GORP is a common form of Trail Mix that often uses different ingredients for variations in flavors. By adding different types of dried fruits, or candy coated chocolate bits (M&M's®) rather than chocolate chips, the recipe for the mixture changes so it continues to be enjoyable for those preferring more of a variety of flavors.